Scott Riggs is the webmaster for the riblakehistory.com website. He is the son-in-law of the founder of the Rib Lake Historical Society, Robert P. Rusch. If you have any questions, comments, or ideas for the site, please email Scott at: sriggs@riblakehistory.com. Scott has been employed at Best Buy Co. (Richfield, MN) since 2007. His present role is Operations Specialist in the Best Buy For Business division. He grew up in New Hope, MN, and graduated from Robbinsdale Armstrong High School in Plymouth, MN in 1987. Scott received a B.A. in Communications from St Cloud State University in St Cloud, MN in 1993. He married Robin (Rusch) Riggs in September 2003. 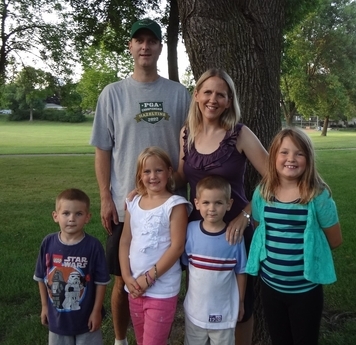 They have four children (Kirstin, Trinity, Brendan & Colton), and live in Crystal, MN. He is also the webmaster for the website www.riggsopen.com, which keeps track of all of the lore of the annual Riggs Open golf tournament. 2017 marked the 34th annual playing of the Riggs Open!